The snow and cold temperatures seem to stay in the Grand Duchy, but we still have to keep going on with our daily routines. 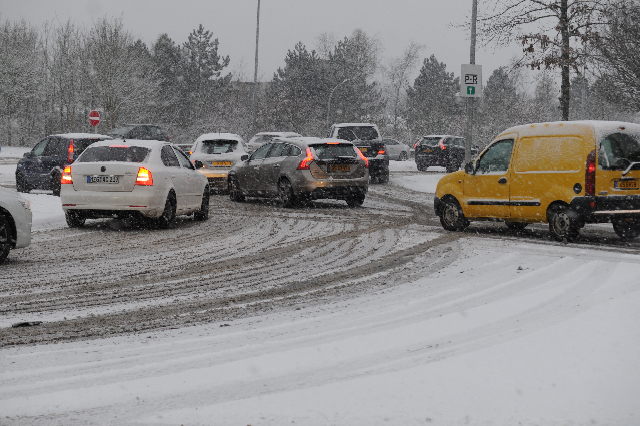 However, driving in the snow may become quite challenging, especially if you come from a snowfree country. If your car gets stuck in some way, forcing you and your family to spend several hours on the roadside, it’s better to be prepared.To ease your snowy experience, especially if you have kids, you should consider keeping a set of things in your car at all times. Some blankets, extra gloves and hats. One complete change of clothes for each child. Car charger for your mobile phone. A kid’s enternainment box, full of stuff to keep your little ones busy. best what would work for them. Patience – You’ll need it! road trip nightmare, and even worse if your children become fussy. unless you really need to get out. Try to use public transportation instead of your own car. Try to use the main roads as these are more likely to have been gritted. In case of an emergency, remember you should dial 112 and remain calm. And don’t forget your obligation of winter tyres in the Grand-Duchy! These tips can easily be adapted to any long drive with kids to keep sane and safe! tip by posting a comment below. And if you are going to travel far – I’d bring a thermos with tea… If you get stuck somewhere because of an accident your car will cool down quickly… Anyway – thanks Rute for bringing this up!